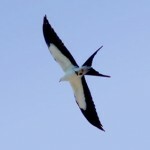 Large and heavy with long pointed wings and large bill. Displays a light patch on upper primaries, has white wrist marks, or “commas” as they are called above and the primaries are light and black-tipped below; dark morph has whitish underparts with a dark V formed by the legs. Has a pale head and a rusty body above and rusty legs. Behavior: This Buteo is commonly seen soaring or perching on poles or the ground. Habitat: Open country; primarily large tracts of prairie plains and badlands. Known to breed in trees near streams or on steep slopes, sometimes on mounds in open grasslands. In Nebraska this hawk has been observed in the shortgrass prairie with rock outcrops or scattered trees. It is most common in the western Sandhills and Panhandle during breeding season, observed in the western two-thirds of Nebraska in winter and migration, very rarely in the east. Food: Primarily small mammals including rabbits, ground squirrels, and prairie dogs. Where Seen in Nebraska: Large tracts of prairie in the Panhandle, such as Kimball Grasslands, Oglala National Grassland, Agate Fossil Beds National Monument Area. Wildcat Hills and Pine Ridge areas. In winter, more common south, but present throughout the western two-thirds of Nebraska in open country, commonly associated with prairie dog towns. 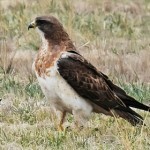 Largest American hawk; Before the elimination of bison in the West, nests of the Ferruginous Hawk were often partially constructed of bison bones and wool. The Rough-legged Hawk, the Ferruginous Hawk, and the Golden Eagle are the only American hawks to have legs feathered all the way to the toes. 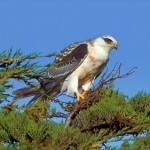 The Ferruginous Hawk can nest in trees and on the ground. The tree nests have larger clutch size than ground nests. 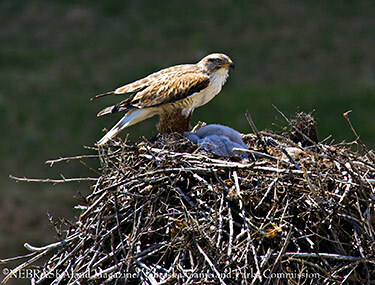 When Bison roamed the plains Ferruginous hawks used their bones, fur, and dung to line their nests, now they use sticks and sometimes cow dung.